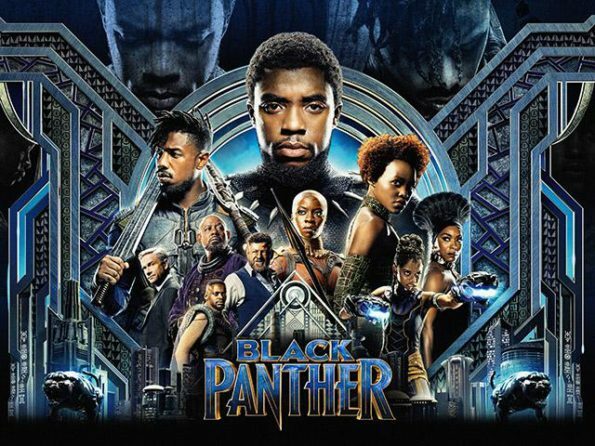 In the film’s case, the fictional African land of Wakanda sits on a reserve of vibranium, a metal from a meteorite that hit the land in the distant past. From this powerful and strong metal, the people of Wakanda have developed advanced technology and a way of life where everyone flourishes. They protect their secret from the outside world until a crisis causes the king and others to question if withholding their knowledge and riches is a good thing. I’ll let you watch the movie to see how they resolve the question. But for us in our daily lives, we must wrestle with similar dilemmas. We have a tendency, or at least I do, to hold on to and not share things I think matter most to me. It’s a natural response and seems justifiable until we delve deeper to ask why. On the surface, it seems we’re merely wanting to protect that which we value: creative ideas, material goods, relationships, our platform, reputation or connections or even our faith and core beliefs. But further reflection reveals that all too often, we don’t share because we’re fearful of what others will think or say. We don’t open up because we’re not sure what others may find. And those walls we put up keep us from the very relationships that would share in our joys and foster a greater appreciation of the treasures we hold. Thus, a downward spiral ensues. The situation in Wakanda isn’t that different. It too reflects an unwillingness to open up or to share. It too stems from fear of loss. We’ll have to wait for the next Black Panther movie to know how their situation plays out. But personally, here’s what I’ve seen and experienced. When we step beyond our insecurities and fear and we share — our lives, our faith, our resources, our dreams — we run the risk of being misunderstood, mocked or abused. But if we don’t, we never experience the paradox of giving away that which we most value: We don’t lose it. We gain more of it. Instead of hoarding and finding ashes, we can give and find something, new, something more and surprising. What we gain may not look the same as what we gave. And, as in anything related to love, we do risk pain. But the very thing we strive to protect by holding on and not sharing, that almost always withers. Only in giving it away does it blossom and grow to become more than we ever envisioned. The only way you learn at the heart level about all that you get by releasing and sharing is to practice it. It isn’t easy. It’s not always immediately rewarding. But over time, the results can be stunning. And you don’t even have to be a superhero to do it. Today starts a periodic series here on The Meaningful Traveler that moves beyond travel to explore glimpses of meaning that can be found not only in travel but in popular culture, in particular books and movies. This isn’t highbrow literary critique as today’s first Glimpse reveals. However, I hope you find it both interesting and even helpful. 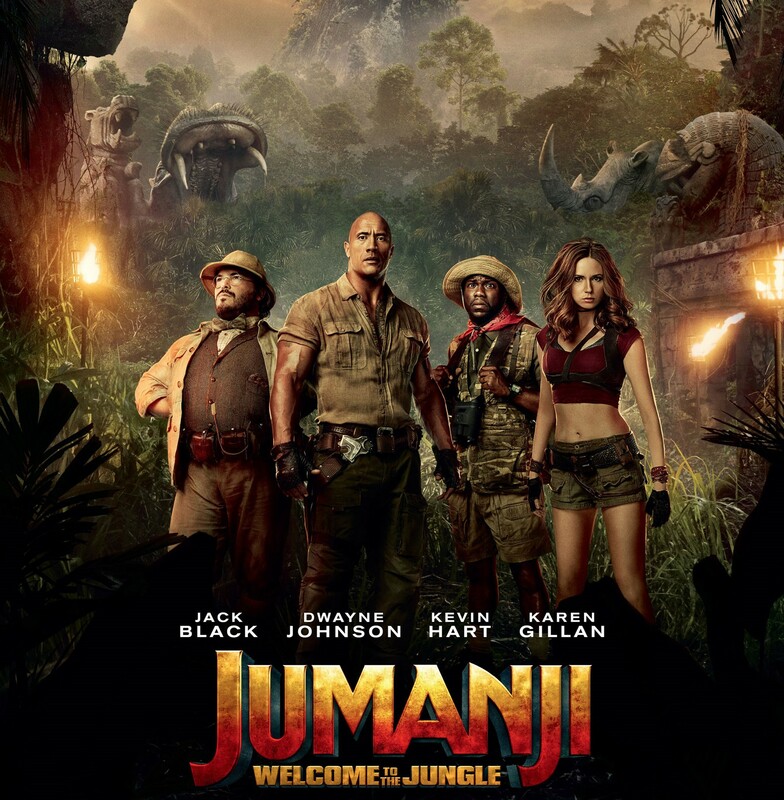 The premise of the movie, “Jumanji: Welcome to the Jungle,” defies reason. Which is what makes it work. Four high school students stumble upon an old video game console. When they turn it on, select their character avatars for the game and hit “Start,” the fun begins. Each is transported — in a sort of vaporized and vacuumed manner — into the video game. They each land in the middle of a jungle. The primary humor of the movie derives from the fact that in the game, each student is now in the body of their avatar character. The nerd ends up as Dwayne “The Rock” Johnson. The tall football player gets the not-so-tall body of Kevin Hart. The intellectual female student ends up in the Lora Croft-like-shorts-and- leather-top-clad body of Karen Gillan. And in, to me, the funniest role of the movie, the oh-so-into-herself hottie student (wait a second: does anyone still say “hottie?” Or “babe?” “Fox?” How about “sizzlin’ siren?”) ends up as the pith-helmet-wearing professor played by Jack Black. Yep. Nacho Libre as a girl in a man’s body. That’s the setup. The rest of the movie is mildly amusing with interludes that cause laughs as big as Dwayne Johnson’s biceps. Or almost. But it isn’t the humor we’re after here on our little trek through the jungles of Jumanji. It’s far more dramatic — for a comedy — in the film than my rendition here, but it brings up an interesting question: Who are we really? Could those characters have become their new selves at home? Or did it take some extraordinary event — in this case getting new bodies and corresponding skill sets — and a new community (none of the characters were friends before their transformation) to become who they now are? Is our identity fixed or can we become more than we perceive ourselves to be? Certainly every self-help book would affirm our ability to become the better — make that best, no bestest — version of ourselves. But in real life, what causes that change? Does it come from inside or out? I’ve seen a lot of people that want to change. But I’ve only known a few that have. As in really change. Not haircut or new diet or move to the big city or midlife-crisis change. Change as in a fundamental altering (or is it clarifying?) of their identity. And almost all of those that become something much greater than they were before did so because of something radical from both within and without. That may have been the combination of community and a “higher power” through a recovery program like AA. Or it may have been because someone loved them and invested in their life enough to alter their trajectory, someone who saw them as more than they saw in themselves. Or it may have been because the person turned to God in the realization that their current plan and path in life wasn’t working. But as much as we love to praise the “self-made man” or the woman who has “pulled herself up by her bootstraps,” I’ve rarely seen a significant improvement in a person’s character come about all by themselves. In short, we need each other and something or Someone beyond us to help us become what we were meant to be. It takes a person or situation beyond us to draw out what lies within us. That may be an intense struggle, family or friends who never give up, extreme hardship or a transcendent experience. But we can’t do this thing called life alone, even when it comes to something as individualistic as our own identity. After all, even the characters in Jumanji needed each other. Oh, that and that freaky video game. 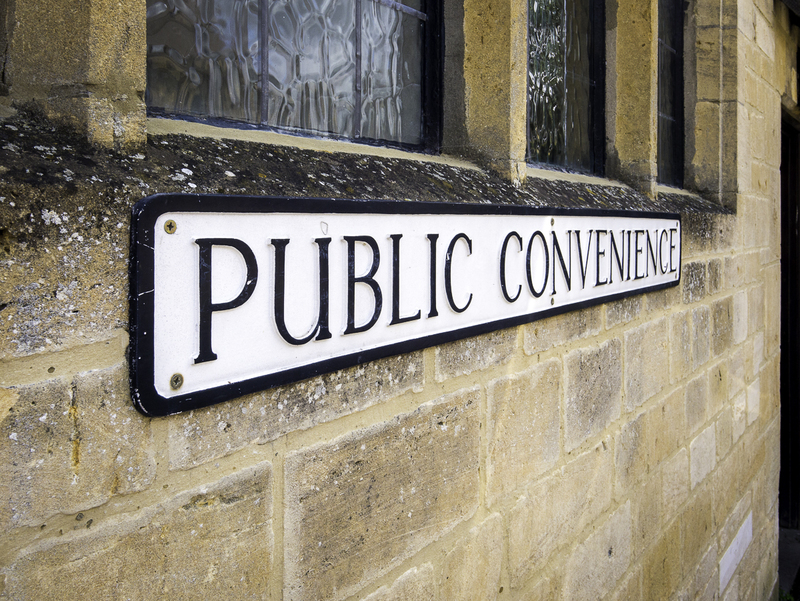 The sign outside read “Public Convenience.” Leave it to the British, I thought, to come up with such a polite euphemism. It’s actually more accurate than our term, “Restrooms.” After all, people don’t actually rest in there, do they? But convenient, especially after a few too many cups of tea? Indeed. Equally convenient are the wavy glass panes used for the window of this particular public restroom, er, convenience, in Chipping Camden, England. The wavy glass lets the light in, but provides privacy to those, uh, convening, or resting or using the loo or whatever phrase you care to choose. That same wavy glass also provides (or at least it did for me), a lovely object lesson. Take a look at what I saw from inside the Public Convenience. It looks like the world we know, but not quite. Everything is familiar, yet distorted. 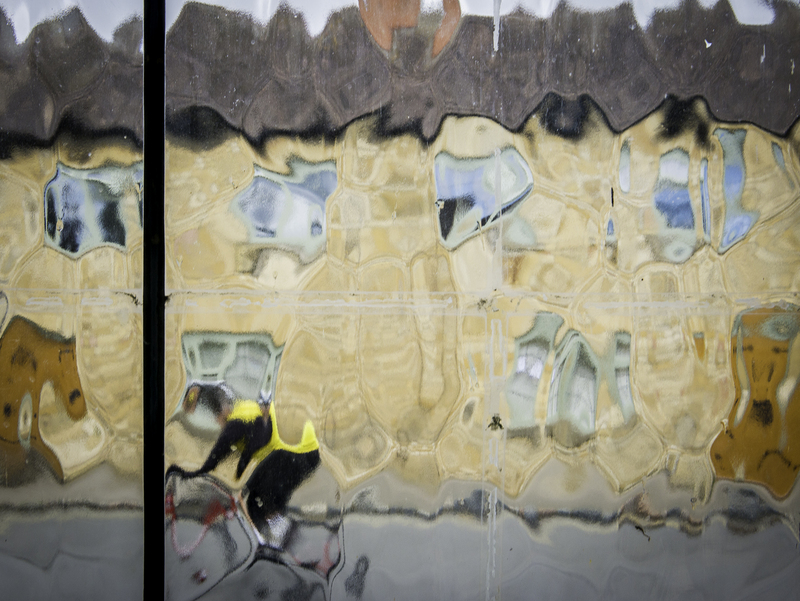 If I hadn’t told you it was a wavy glass window, would you know what this picture was? You might think I’d messed about in Photoshop or otherwise distorted the image. But encountering this view in real life forced me to look at it again. And again. And that’s the whole point. We never (or rarely) do that. We are loathe to take the second look because, let’s face it: why bother? There’s no time. Or no reason. We have plenty of new things to see. Why pause and re-examine what we just looked at? Because what we just looked at, we didn’t really see. Quick. Don’t cheat and glance up. But tell me, how many doors are on the house in the photo? How many chimneys? Windows? What color is the bicycle? How many panes are there in the window? You might be able to recall the building was yellow and that there was a bicyclist in it. Did you recall any of the other details? You’re in good company. Only when I re-examined the photo did I see any of that. And why did I re-examine this photo? Because it intrigued me. Something about the distortion of reality made me want to see reality better. Let’s go deeper (cue the woo-woo music). I think God throws variations like this window at us all the time. God gets our attention with something curious. We then have a choice: Pursue it or ignore it. The pursuit, however, requires us to pause and take notice, to yield to the hint, the glimmer, the still small voice, which then reveals so much more. For example, one of the most delightful things I encountered in the myriad English gardens on this trip were the diverse types of bees humming about. The bumblebees there (24 species, to be exact) don’t look like the ones where I live. So I noticed them. But I didn’t notice the one right in front of me on the window until I took a closer look at this photo. The bee is likely too small for you to see unless you click on the photo for the enlarged version. It’s near the middle about the same height up from the bottom of the photo as the bicyclist’s back. See it? I’d never have bothered had this been a normal, clear window. It was only because of the anomaly or novelty of the wavy glass view that I made the effort to look. I believe every day is filled with such examples. Scenes right before me that God wants me to notice for no other reason than to bring me joy. There’s nothing important about this photo. But every time I look at it now, I see something new. Something more. Something that delights. And all the distortions in it make me want to go take a look at the “real” world with new eyes. In part to appreciate it better. And in part to reconsider what is real and what is distorted and to learn the difference. Beware of stepping into a Public Convenience. You never know what you’ll see. Leaving behind secret works of creativity or humor that no one knows you did can delight those who find them in part due to the mystery of the maker. Sometimes we travel hoping to find something that will move us in the world around us only to discover that what we seek, our True North, may instead lay within. After losing my passport in the Madrid airport and then finding it, I still had a long way to go to make my flight. And what happened along the way provides a good reminder that there are worse things to lose than your passport.